FRANKFURT — The European Central Bank was expected to take another small step toward normalcy Thursday. Then came Italy. A confused election result in one of the eurozone’s biggest and most troubled countries may well prompt the central bank’s policymakers to slow down its exit from crisis mode. The specter of a trade war with the United States could also give members of the bank’s Governing Council reason to pause. That would have been a subtle but important change. 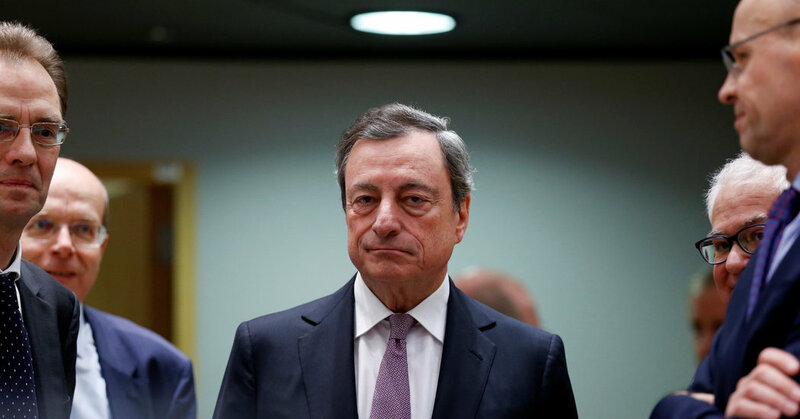 By omitting the phrase, which it has repeated since December 2016, the central bank would in effect be saying that the eurozone was no longer in imminent danger of going up in flames, and that it was time to begin stowing the fire hoses. On Sunday, though, about half of Italians voted for populist candidates on the left and right, while leaving no party with a clear mandate to form a government. There is now very little chance that Italy will make the sweeping changes needed to break its economy out of prolonged stagnation. The country’s political deadlock and economic doldrums are a threat to the rest of the common currency area. Italy’s government debt — measured as a percentage of economic output — is among the highest in the world and, in Europe, second only to Greece’s. But Italy also has the eurozone’s third-largest economy, with output 10 times that of Greece, making it a far bigger danger to the region’s financial stability if investors begin to doubt the government’s solvency. Italy is not the only risk for Europe to appear in recent days. Trade relations with the United States are in doubt after President Trump threatened to impose tariffs on steel and aluminum imports, prompting the European Union to consider retaliating with levies on products like Harley-Davidsons and bourbon. Surveys show that the threat of a trade war has clouded the optimism that had prevailed among European consumers and business managers. All those uncertainties are rattling financial markets. As a result, the Governing Council “may not want to add to the confusion by changing its monetary policy statement this week,” analysts at Barclays said in a note to investors. Instead, policymakers will probably leave well enough alone and continue to express their readiness to ramp up the stimulus if there is any sign of trouble. The council is scheduled to announce any decisions at 1:45 p.m. Frankfurt time (7:45 a.m. Eastern time), and Mario Draghi, the president of the central bank, planned a news conference beginning at 2:30 p.m.
To be sure, there is a faction on the Governing Council that is worried that inflation, now dormant, could get out of hand if the central bank waits too long to stop its purchases of government and corporate bonds, a form of money printing intended to stimulate the economy. So far that faction has been in the minority. More likely, the outcome of the meeting will be similar to the one in January. Then, members of the Governing Council talked about whether the central bank should change what is known as its forward guidance — the wording it uses to signal its intentions to financial markets. A tweak in the language would set the stage for the central bank to phase out bond purchases by the end of this year and begin raising official interest rates in 2019. February 14, 2019 Comments Off on The Perfect Valentine? A Math Formula.